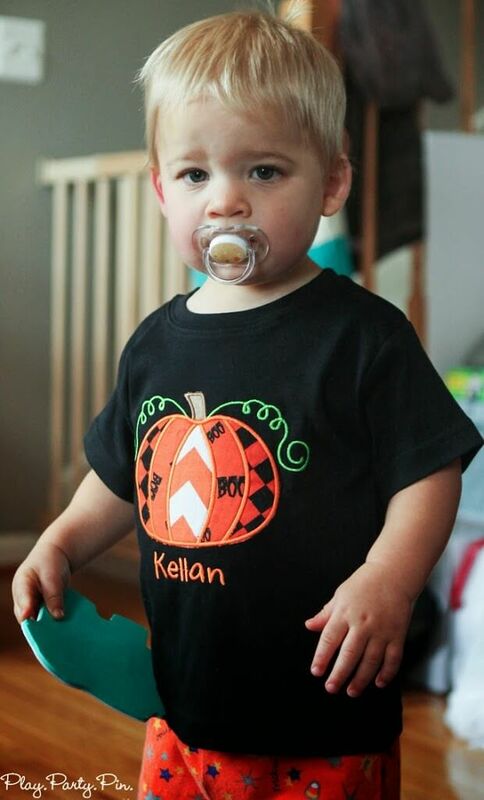 All opinions are mine alone.Last year for Halloween, K was sitting up but not walking or really crawling a lot. So our Halloween party consisted of putting the kids in costumes and eating snacks while they sat there and laughed at each other in their silly costumes. 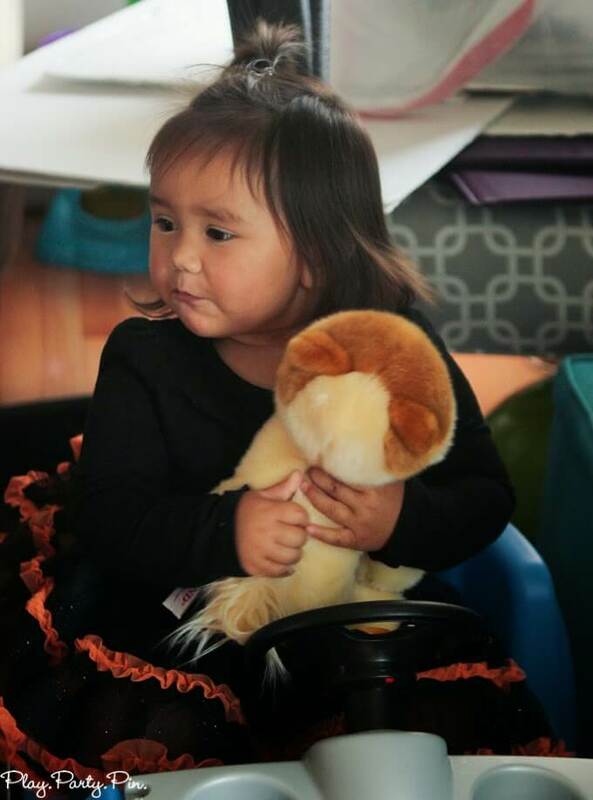 Last week I had a bunch of my same mom friends come over for a Boo Under Two Halloween party, complete with lots of fun toddler Halloween snacks, drinks, and activities. It was amazing to see how much changed in just one short year. To prep for my party, I headed over to Walmart to pick up everything I would need for the party. 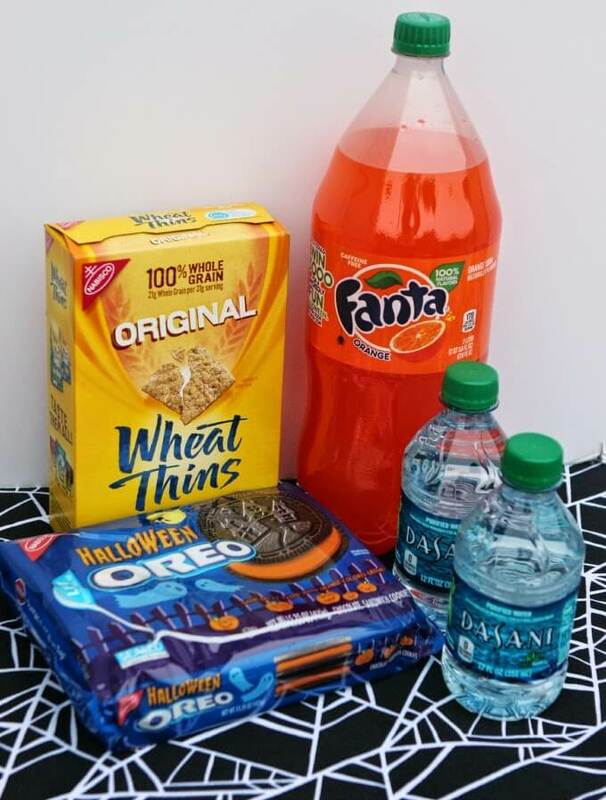 K came with me and helped me pick out some of his favorite treats – Dasani Water, Wheat Thins, and Halloween Oreos. 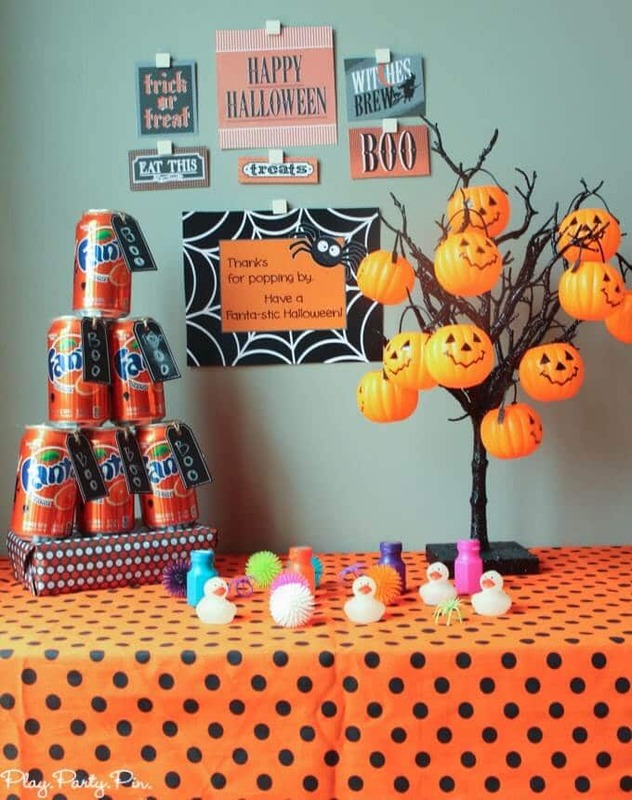 And I saw the Orange Fanta and knew it would be perfect with its bright orange color and Halloween decorated cans. 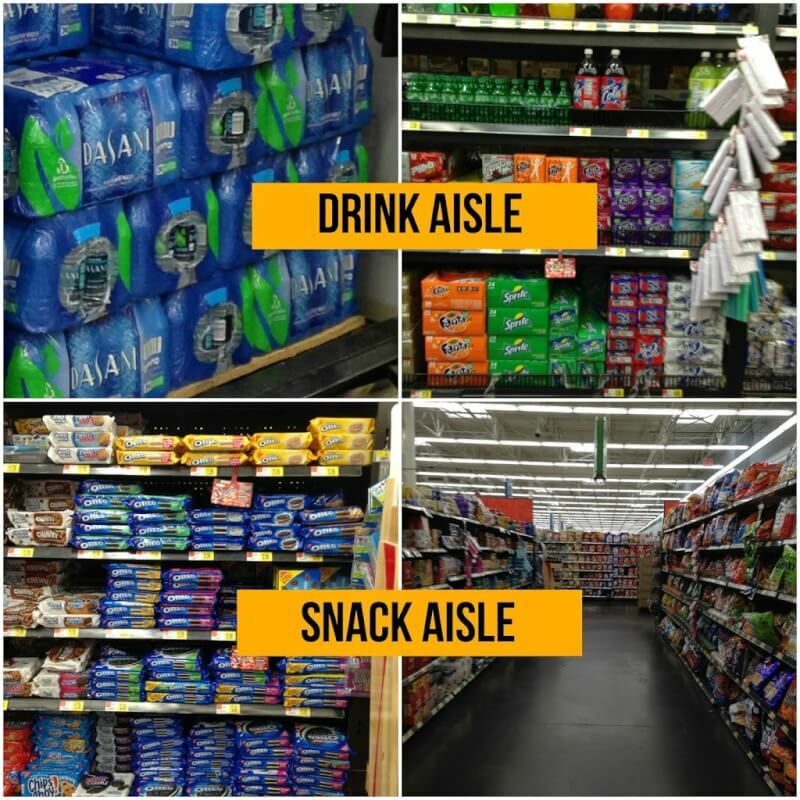 Luckily the Wheat Thins and Oreos are both in the snack aisle and the Fanta and Dasani are both in the beverage aisle, so it was a short shopping trip. And it’s a good thing because K has recently decided that he wants to scream anytime we go into a store. I think all of the kids love coming to my house because they know that there will be a table full of treats, and this party was no different. I set up a trick or treat dessert table full of treats and drinks that I knew the little munchkins would like. Since this was a toddler party, I wanted to keep it more cute than creepy. 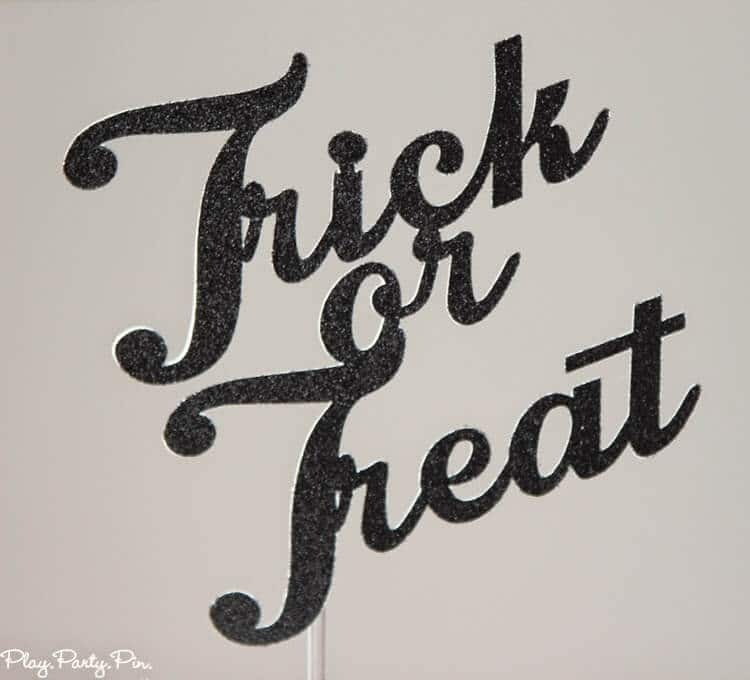 I did that using the fun printables from Swish Printables combined with my spiderweb backdrop, bright colors, and playful accents like the party banner on my haunted cupcake box and glittery trick or treat cake topper from Pink Poppy Party Shoppe. 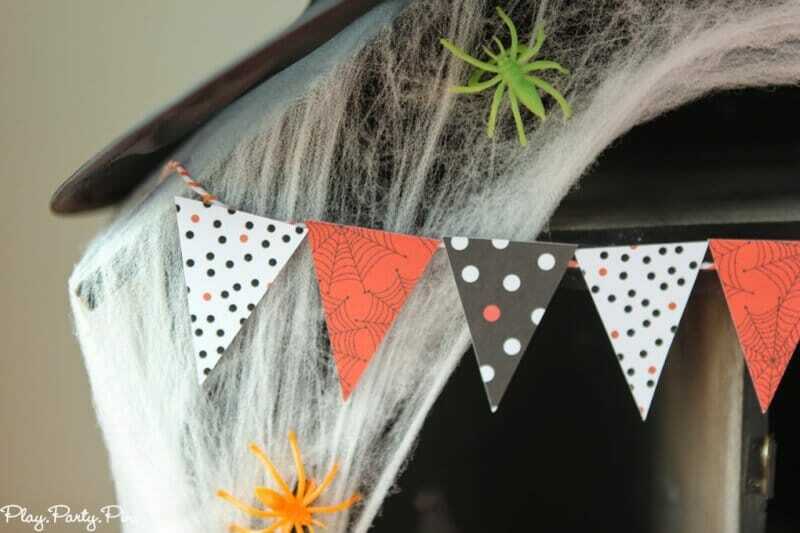 I also picked just four colors – black, white, orange, and green – and stuck with a couple of main non-scary Halloween themes to tie everything together – “Boo,” pumpkins, witches, and spiders. On either side of the cake, I included tall elements to balance out the two sides of the table. On one side, the custom haunted house cupcake box that I made out a house prop I picked up on clearance (tutorial coming soon), and on the other side, my trick or treat tree. 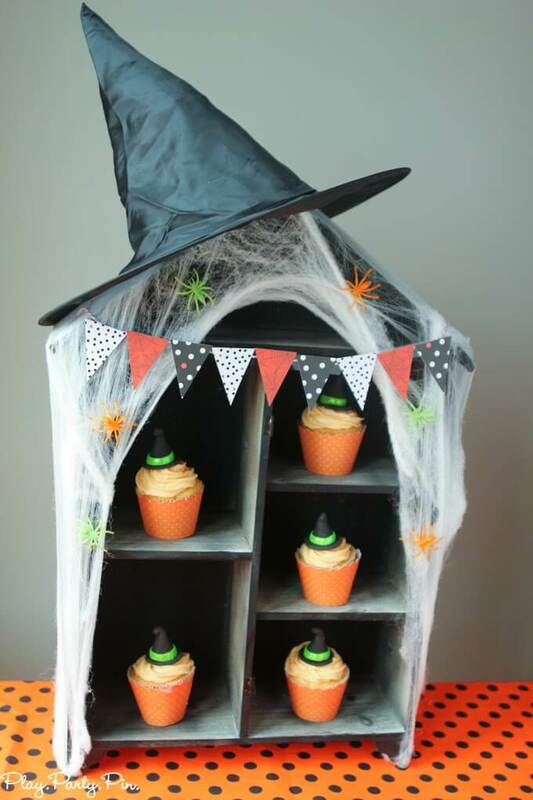 The cupcake box was filled homemade cupcakes that were wrapped in black and orange polka cupcake wrappers from Hoopla Events and topped with the cutest little glittery witch hats from Edible Details. I love how the house turned out with the colorful spiderwebs, witch’s hat, and party banner that matches my Halloween mantel. In the middle of the table in front of the cake, I setup my chocolate covered Oreo pumpkin. 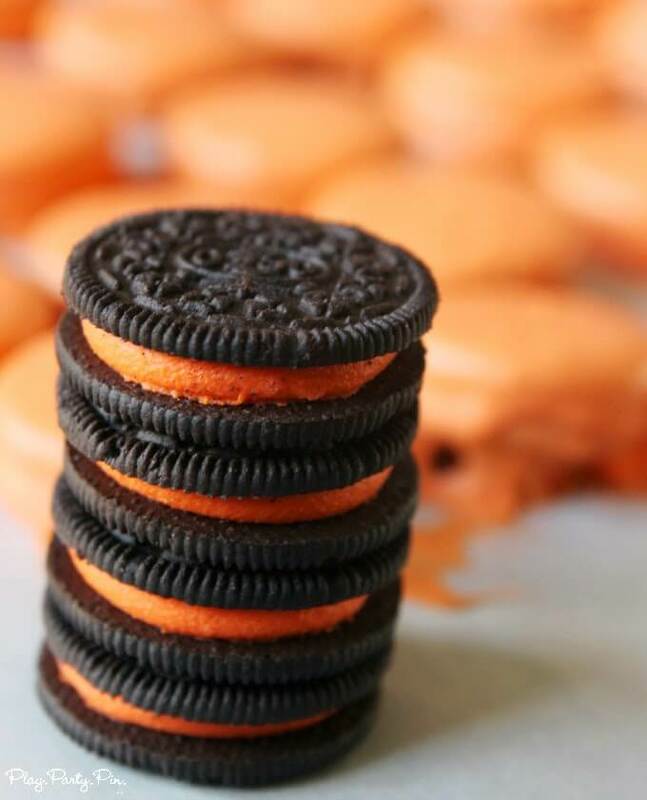 Have you had the Halloween Oreos? 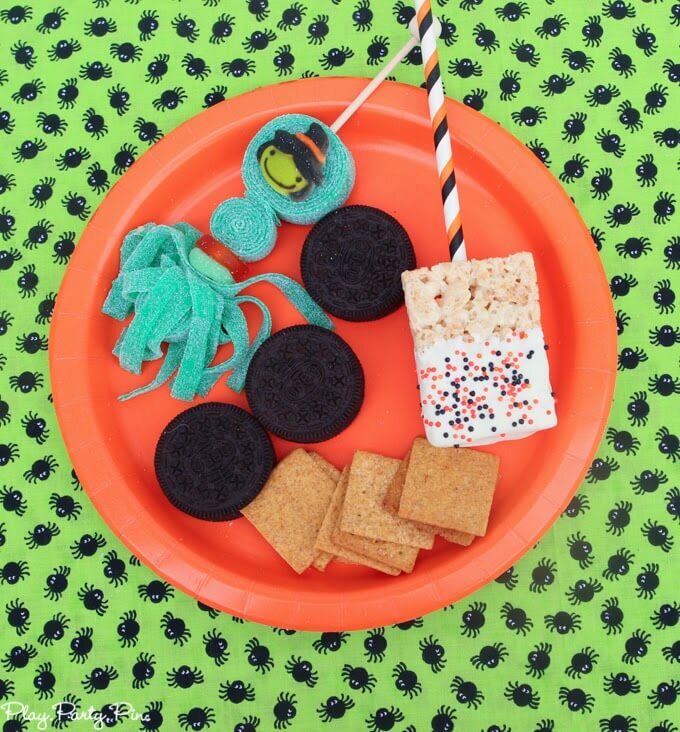 We all agreed during the party that there is just something about the Halloween Oreos that makes them taste especially delicious. 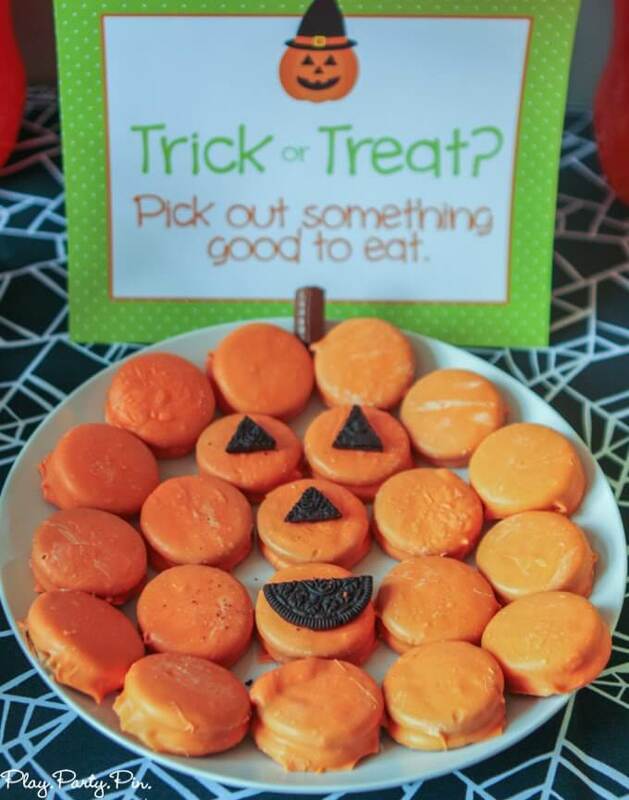 All I did to make the pumpkin Oreo was covered the Oreos in chocolate using the same method I used to make my cream puff pumpkins. 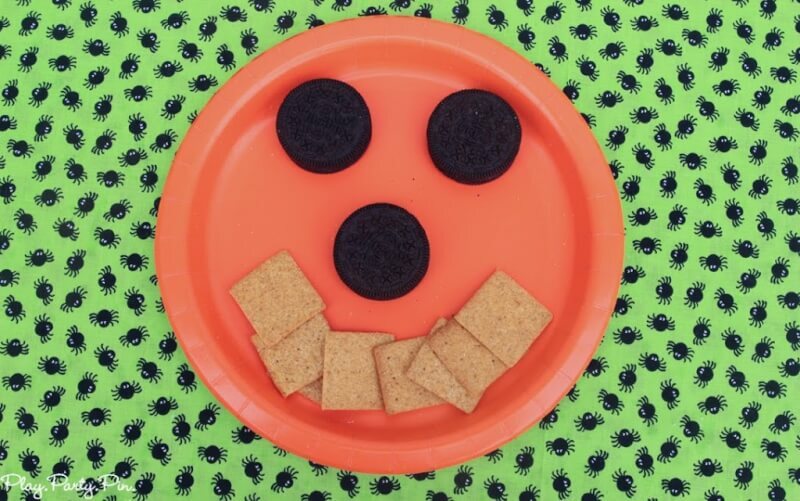 I cut triangles out of Oreos to make the face and used a chocolate candy to make the stem. Such an easy yet cute project. 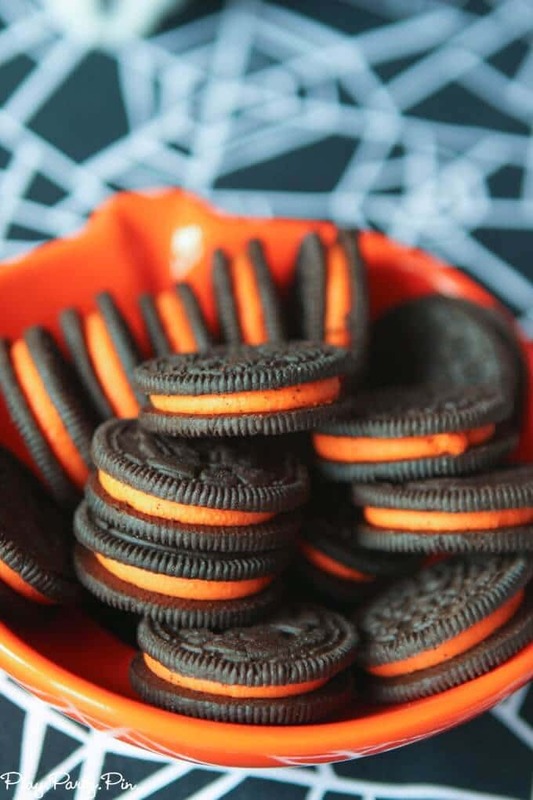 And on either side of the table, I set out a pumpkin full of Halloween Oreos just in case people didn’t want their Oreos covered in chocolate. 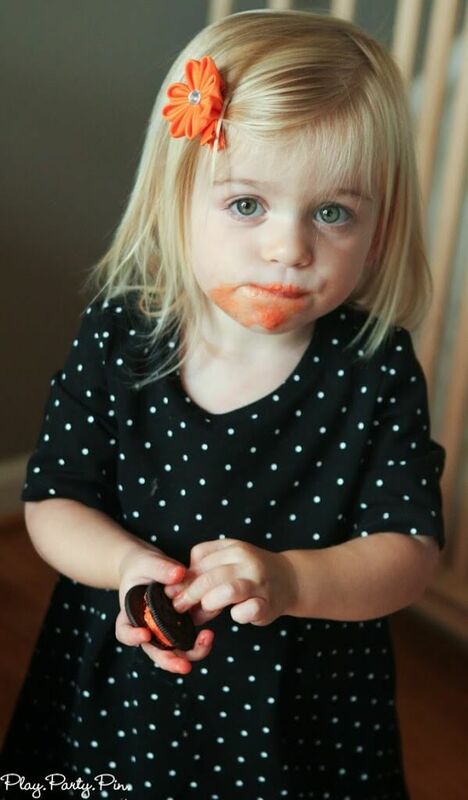 Like my friend’s little girl who I can positively say thoroughly enjoyed her Halloween Oreo. 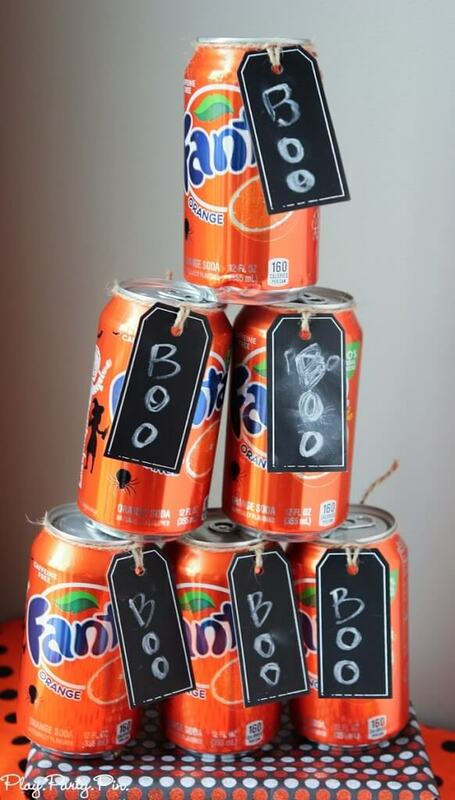 In front of the Oreos, I filled up my favorite BOO ceramic letters with orange candies leftover from a Halloween candy art project (tutorial coming soon). 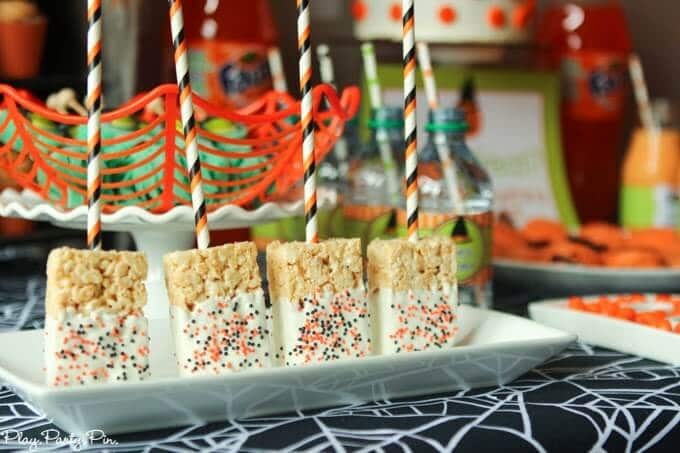 And next to the letters, I put out Halloween rice krispy treat pops from Sweet U Off Your Feet. 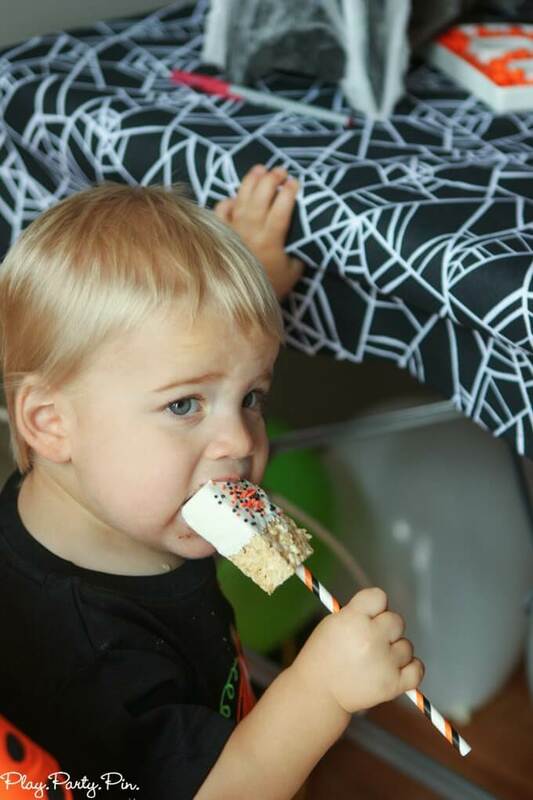 One tip for toddlers – they love anything on a stick so make sure to include some sort of treats on a stick, and you’ll be good to go. 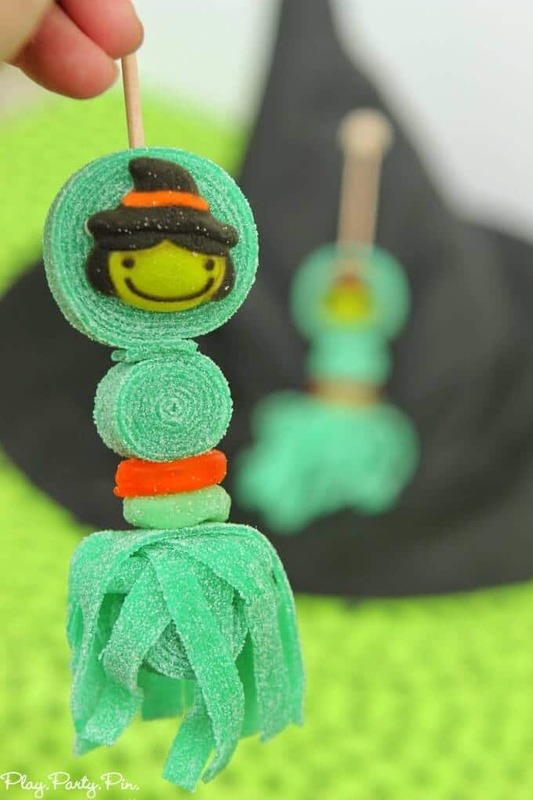 I had the rice krispy pops and the cutest witch candy kabobs from Sweets Indeed, and the kids loved them both. Last but not least, I included three yummy drinks on the table for the kids with polka dot straws from Celebration Lane. 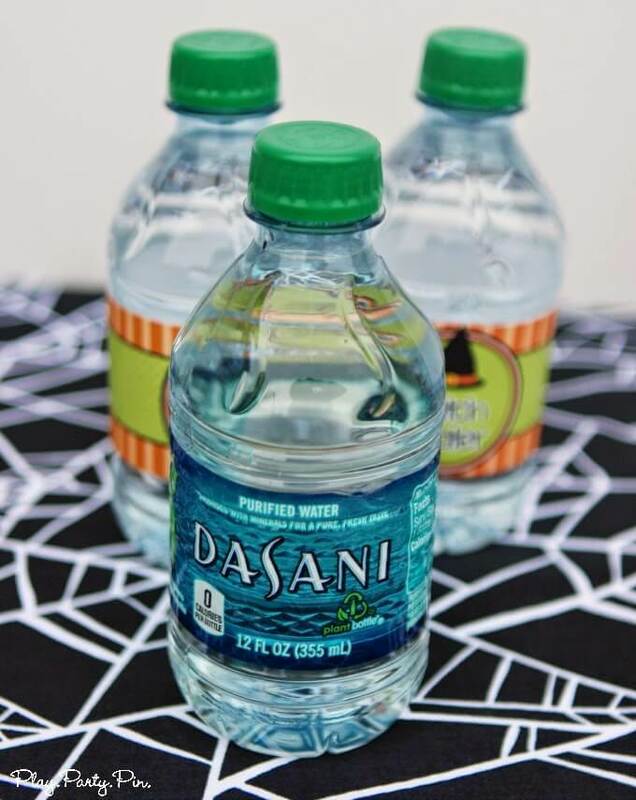 The first were 12oz Dasani water bottles covered with Witch Water bottle labels that are both perfect for toddlers because they’re smaller and perfect for staying refreshed during trick or treating because they’re small enough to fit easily in your bag. 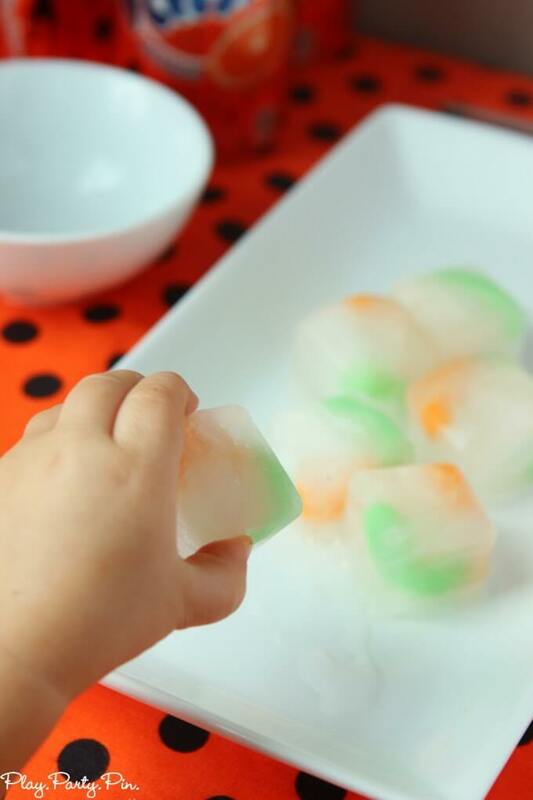 And they are a special shape so they won’t fall over when you put them in the fridge, cold water for everyone! 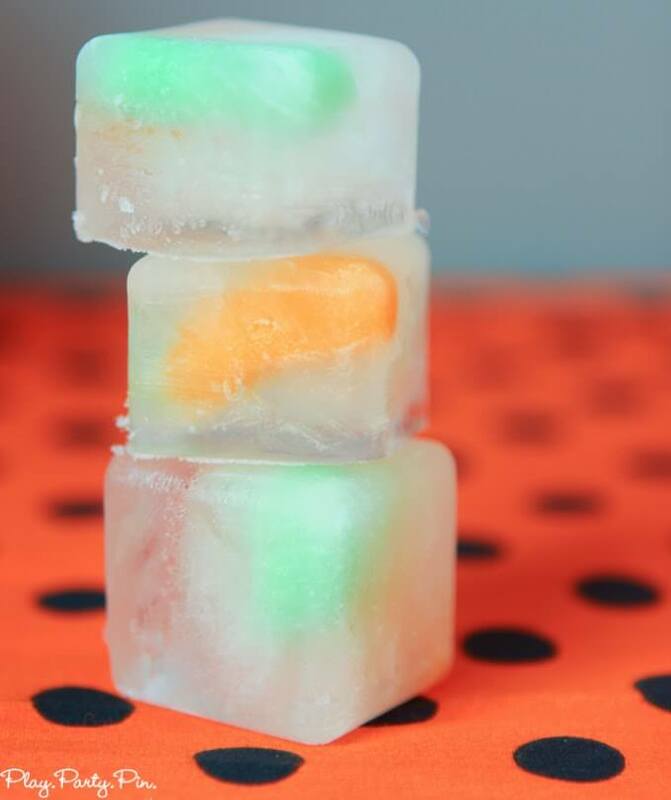 Put a mini gummy worm inside the ice cube tray making sure to push them down so that they’re all the way in the tray. 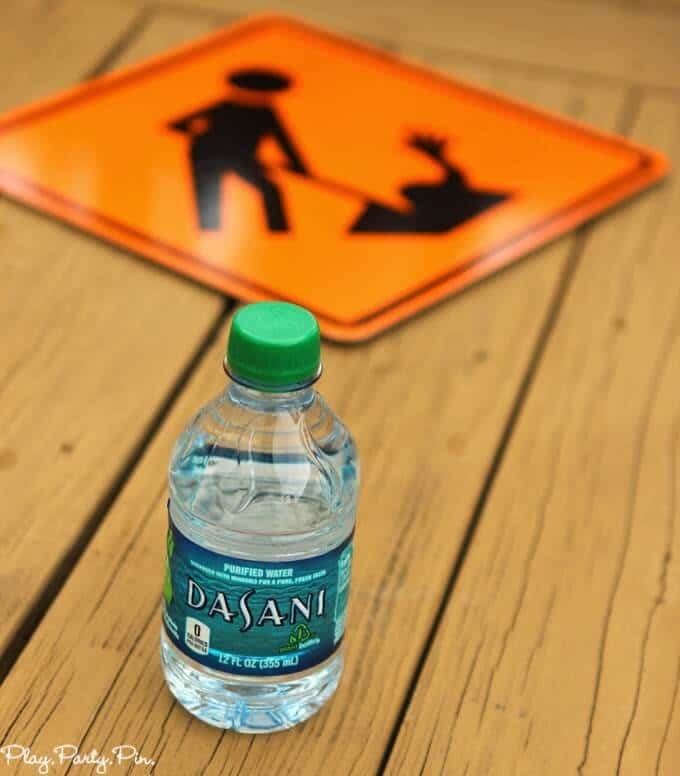 Fill the cubes with Dasani water. Freeze overnight. Then serve with drinks! Using the gummy worms is so fun because when the ice cubes melt, they actually add just a tiny bit of sweetness to your drink. 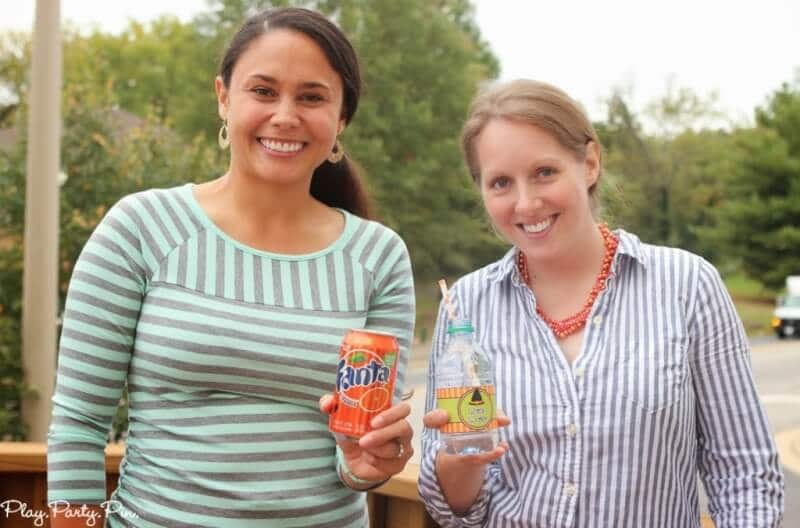 Perfect to add to Fanta or even just Dasani water! 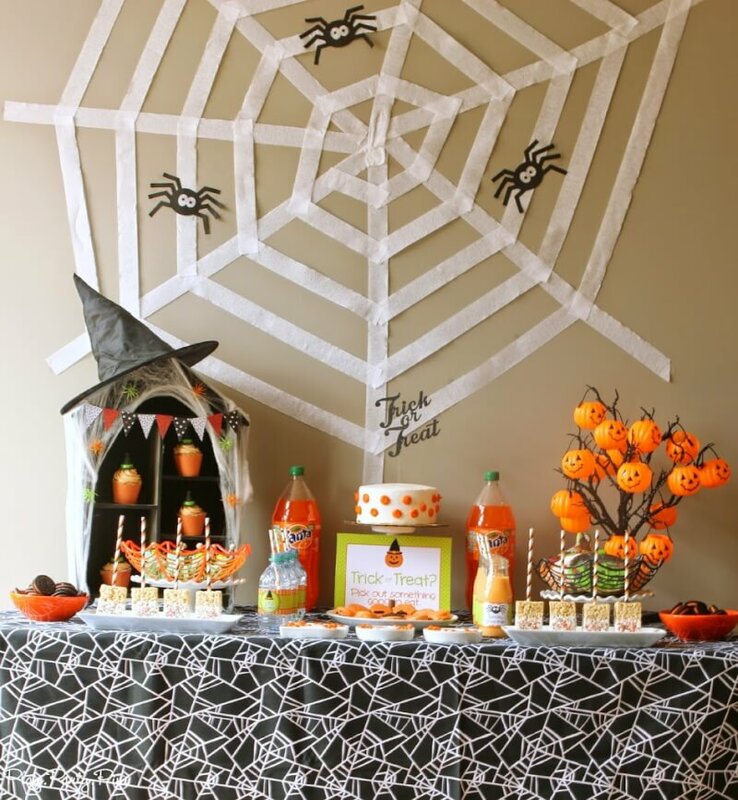 On the other side of the room, I setup a little snack table with paper goods and #spookysnacks for the moms and kids, all with a pumpkin theme. 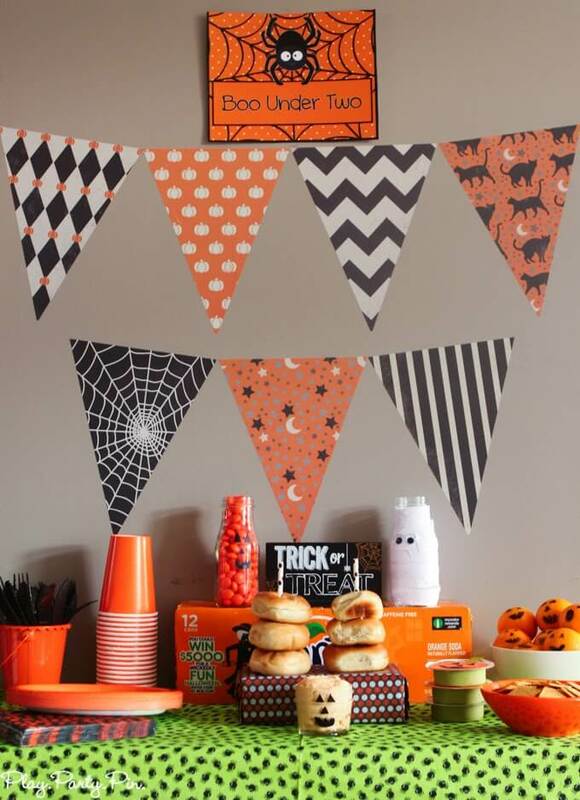 Behind the table, I hung my Boo Under Two sign from Swish Printables and the coolest Halloween banner wall decal from Wallternatives. 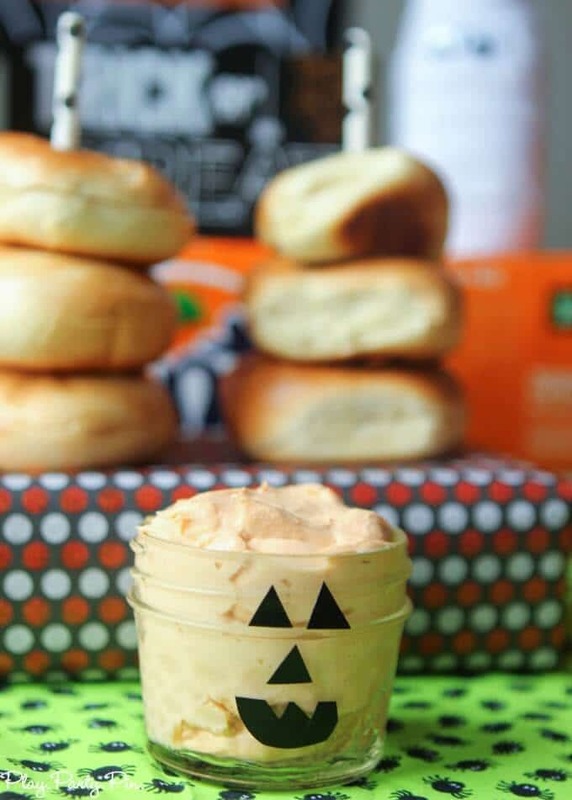 In the middle of the table, I put bagels on a Wheat Thins box that I’d wrapped with polka dot paper with a side of pumpkin cream cheese in a little mason jar I decorated to look like a pumpkin. 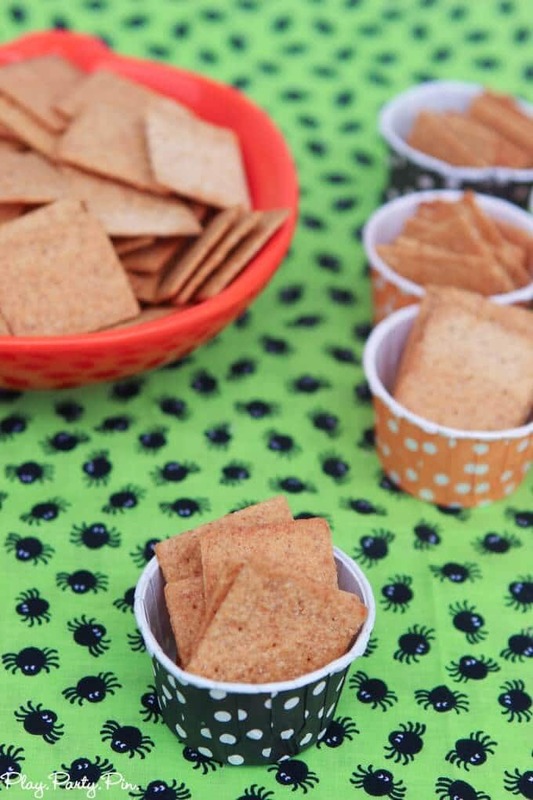 On the side of that, Wheat Thins in a pumpkin dish and individual polka dot cups from Celebration Lane along with little individual guacamoles that I dressed up like pumpkins. 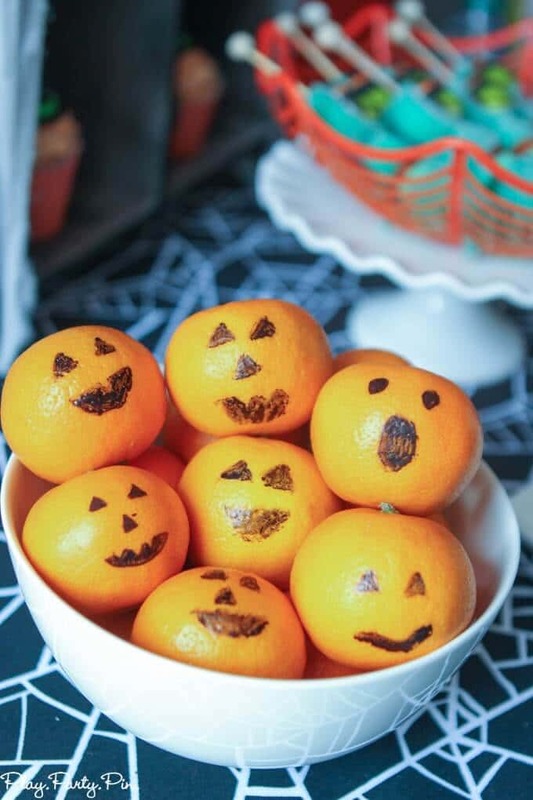 And finally, clementines that I drew pumpkin faces on. 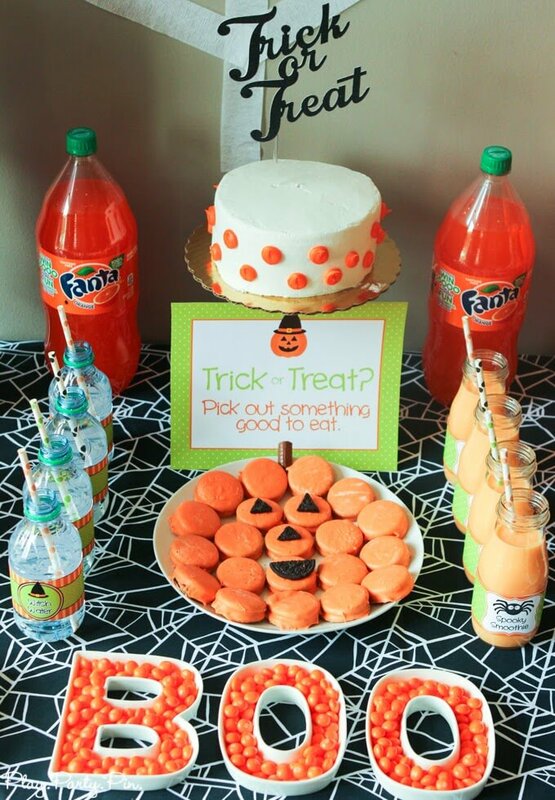 I filled in the empty space on the table with an empty Fanta box and my Halloween drink bottles I made last year. Once all of the kids had eaten, they played with K’s toys for a while. It’s amazing how toys are so much more exciting when they’re not yours. 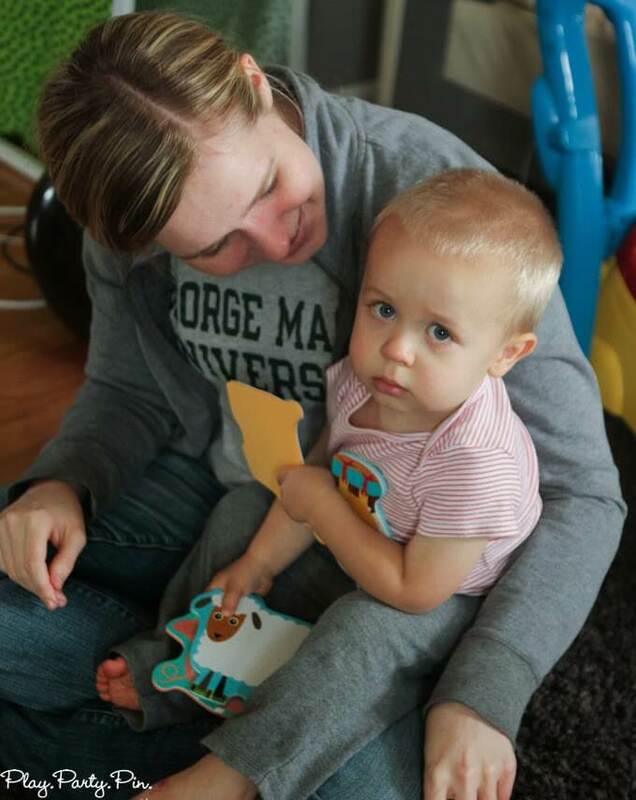 And I’m learning quickly that sharing is not a word in a toddler’s vocabulary. 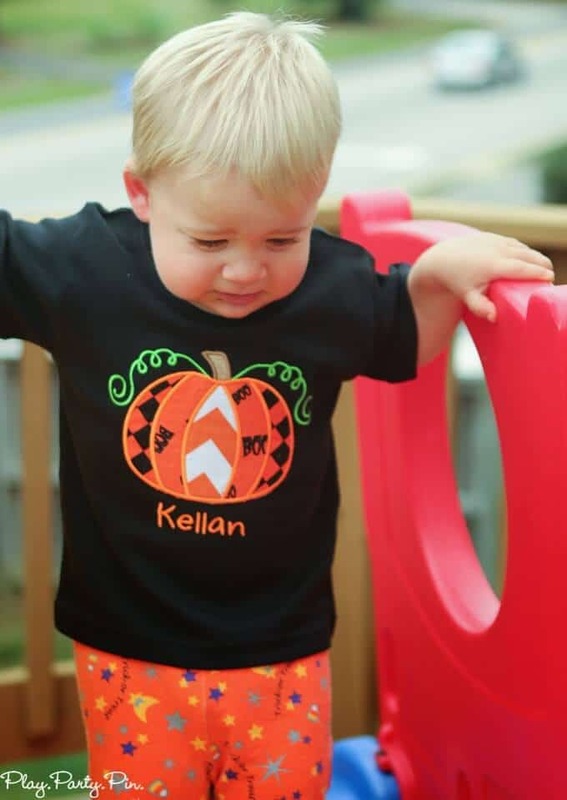 But how cute are these kids in their Halloween outfits? 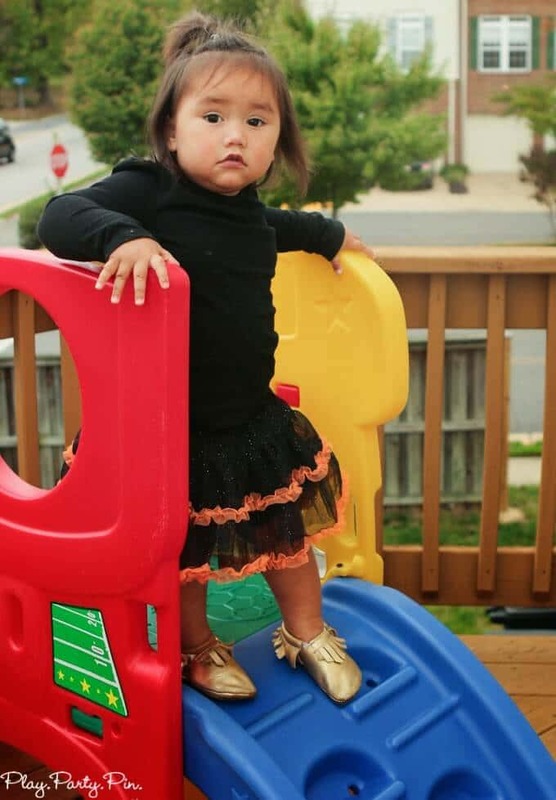 I love the tutu, polka dots, and of course K’s handmade Halloween shirt from Great Stitch. 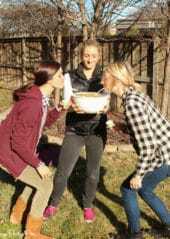 After they were bored of being inside, we went outside for a couple of simple Halloween games. 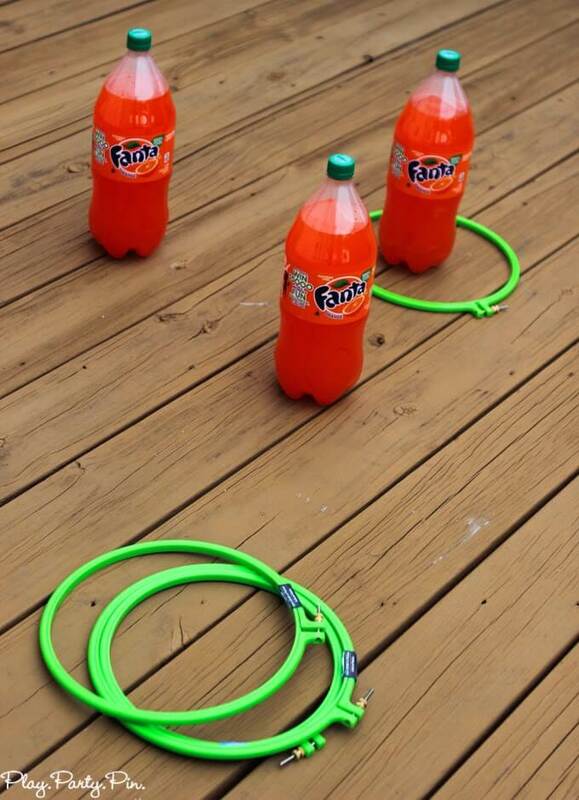 I setup three 2-liter Fanta bottles in a triangle and gave the kids green embroidery hoops to play ring toss. They did a great job getting the rings around the bottles, around their necks, and eventually, off the deck. And then they had a lot of fun just pushing the bottles over without the rings. 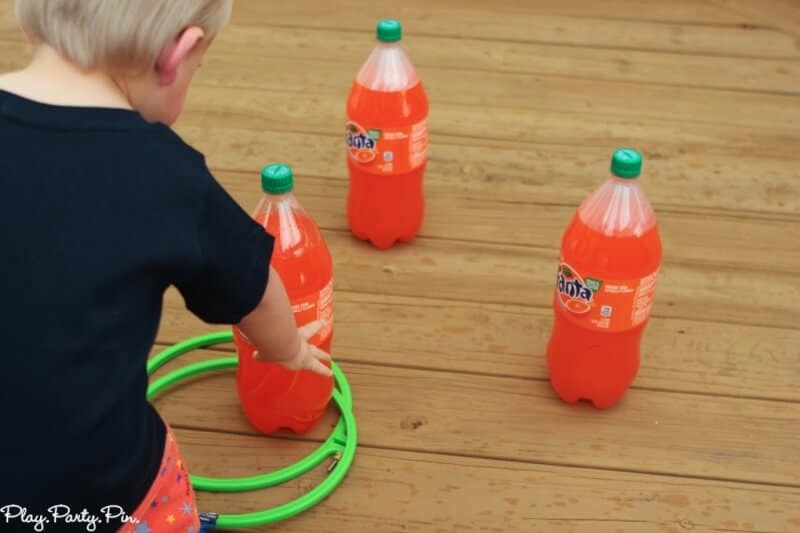 The Fanta bottles are fantastic for this because they’re heavy enough to not fall over when the kids “tossed” the rings at them. Once we’d lost all the rings overboard, we moved on to our second game – creature corners. Basically I put a sign of a different creature (zombies, monsters, etc.) in each of the corners. When I said go, the kids had to run to a corner. 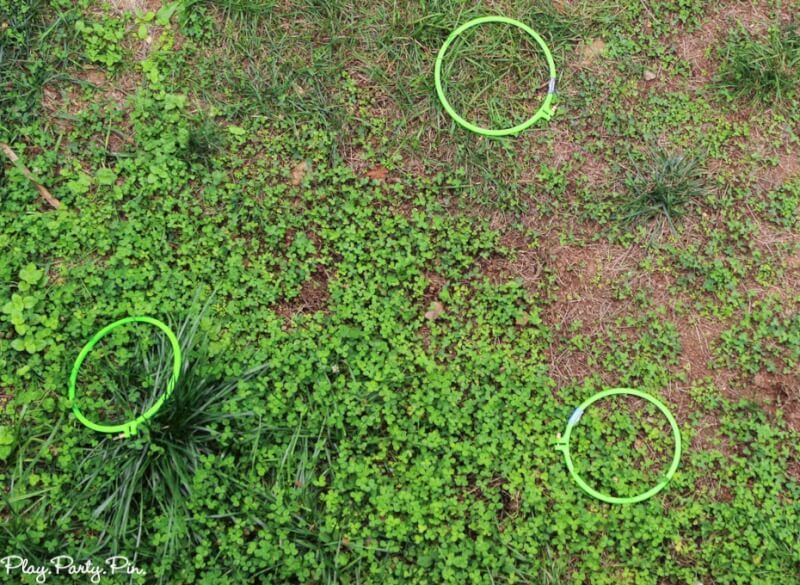 Once they were all in a corner, I spun a Dasani water bottle and whichever corner it landed on, those people were out. The last person standing won a fun little Halloween prize. We played until the kids were tired of running and decided the creature cards were more fun lined up than in the corners. And then they just played on K’s toys and in the rain. Before everyone left, I let them each pick a pumpkin off the trick or treat tree with a little Halloween toy for the kids. And for mom? 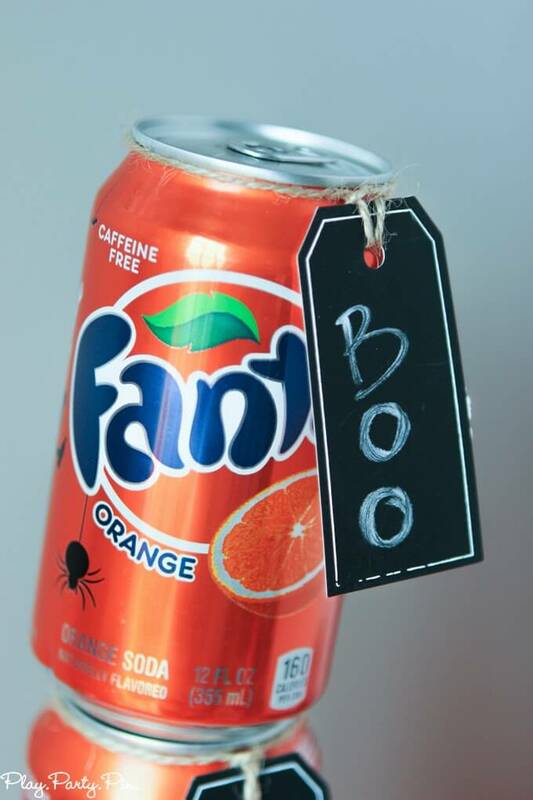 A little Fanta with a “Boo” tag to thank them for “pop-pping” by and to wish them a Fanta-stic Halloween. It might have been a little corny, but I think everyone really did have a fantastic time. 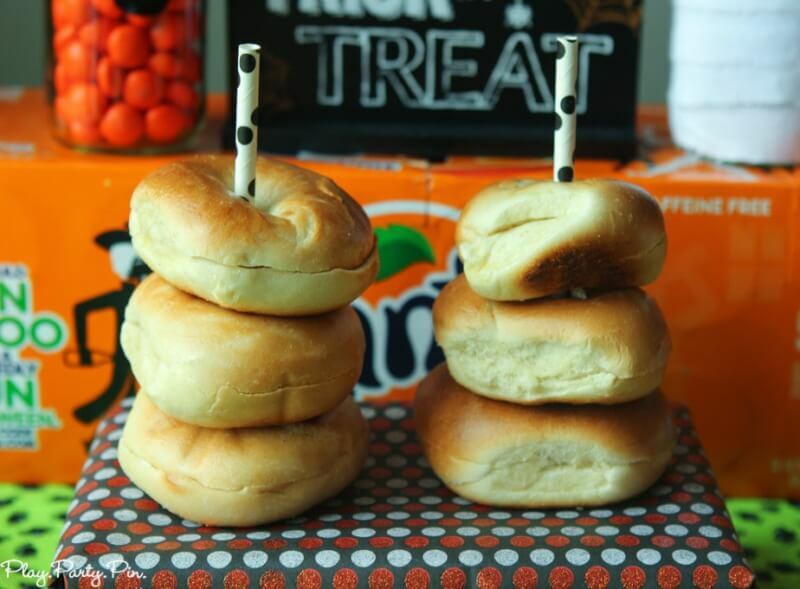 Want more fun ideas for #spookysnacks? 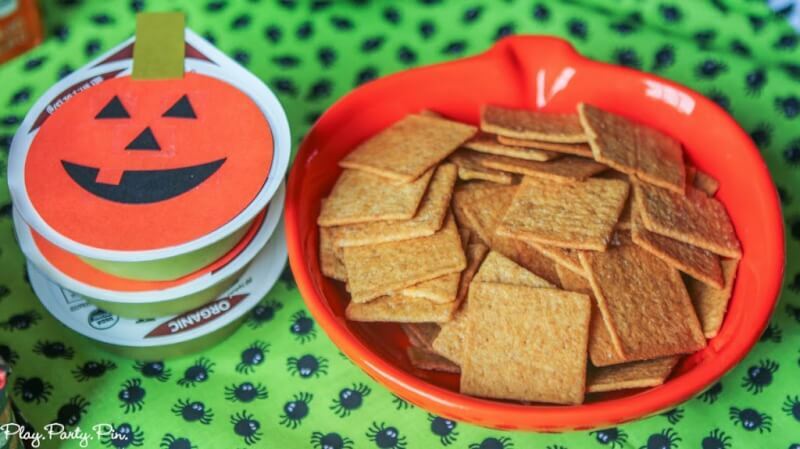 Check out demos at participating Walmarts the weekend of October 25th to try out Wheat Thins, Halloween Oreos, and Fanta. You can check this list to see if your local Walmart or one nearby is having a demo. Party styling/photography – Play. Party. Pin. 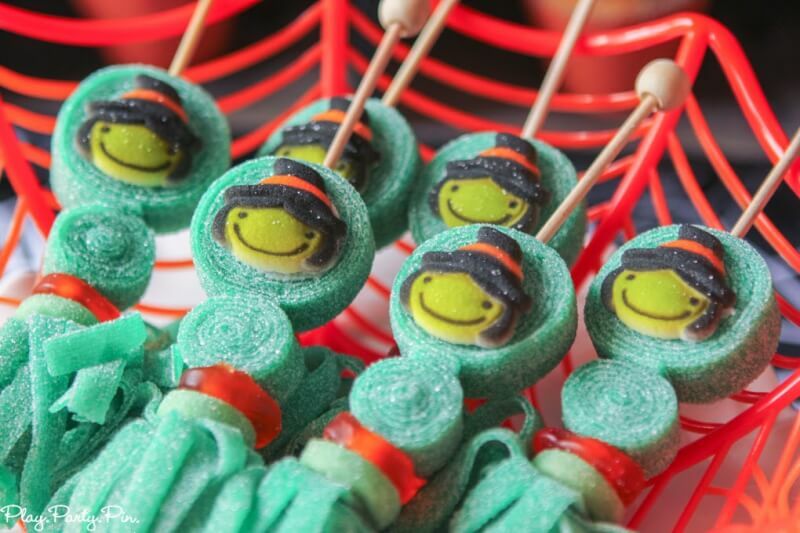 Wow what a super fun party….the kiddos think so to (LOVE the “Orange” face)! Our adorable guests enjoyed it so much! This is so cute! 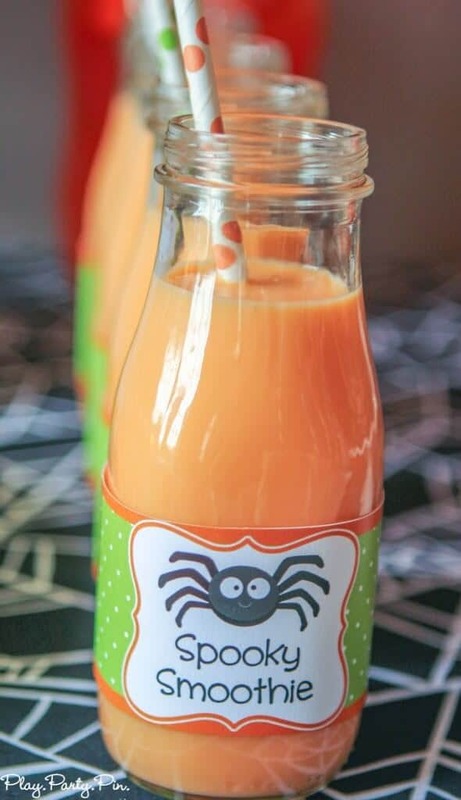 We are having a Halloween party and all the kids will be toddlers, so this was super helpful! Thanks! 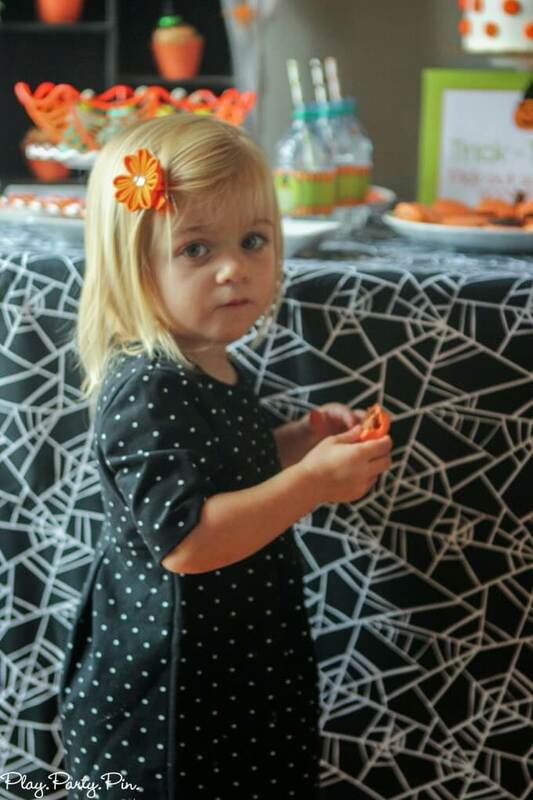 I did a “spooky ” party for preschoolers last year, and it was a ton of fun. 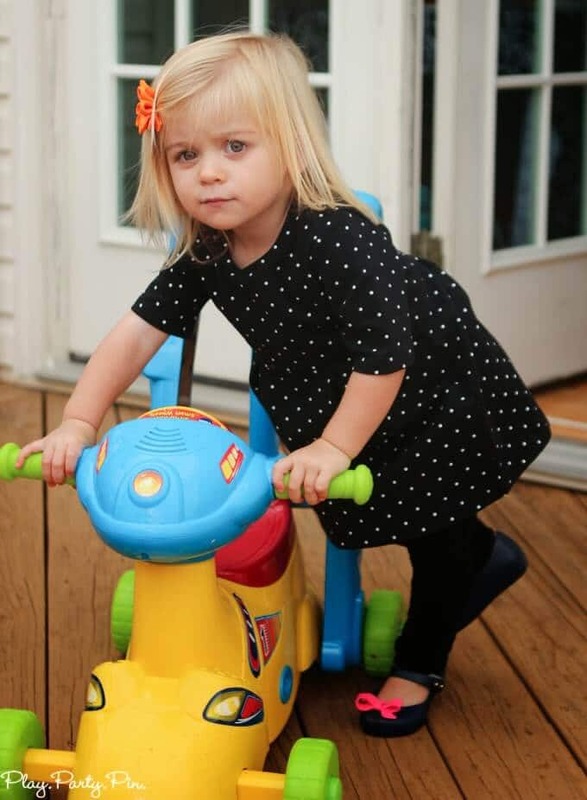 Nice to see other ways that little ones can participate without being scared! 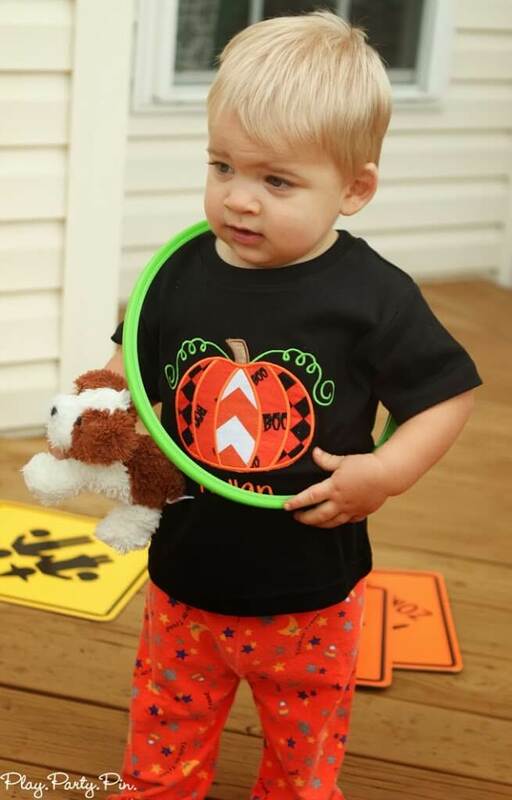 Kids have so much fun during Halloween! It looks like the kids and adults had a blast! 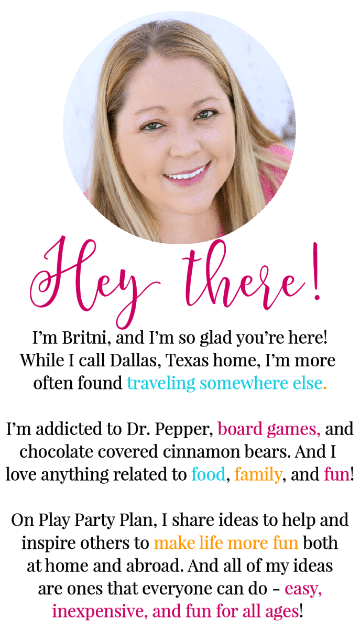 I love all the fun party details — and those games are so creative! What great ideas! 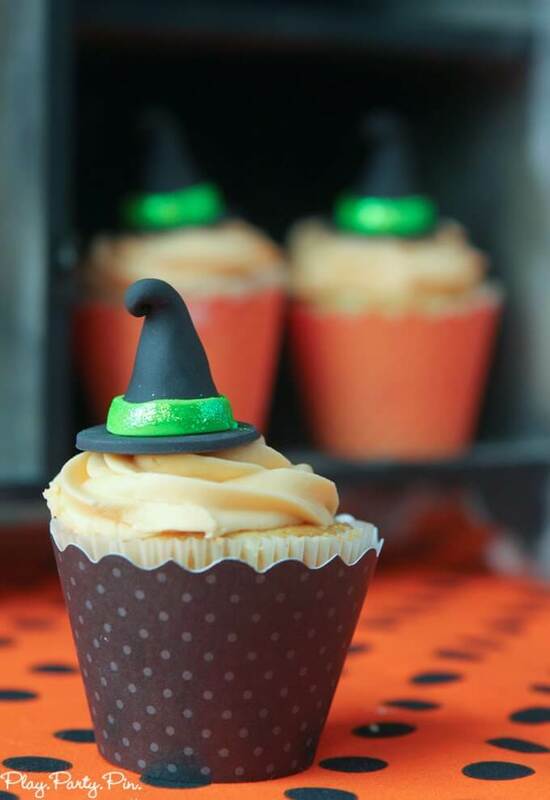 Those witches hat cupcakes are just too cute! Had so much fun baking them! 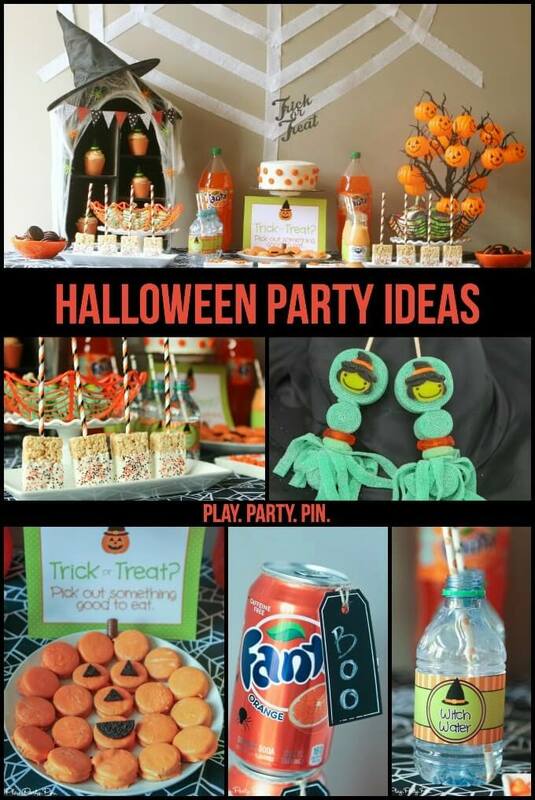 This looks like so much fun.. great ideas and I would love to come to one of these parties. those oranges are adorable!! what a great party, looks like it was a blast! 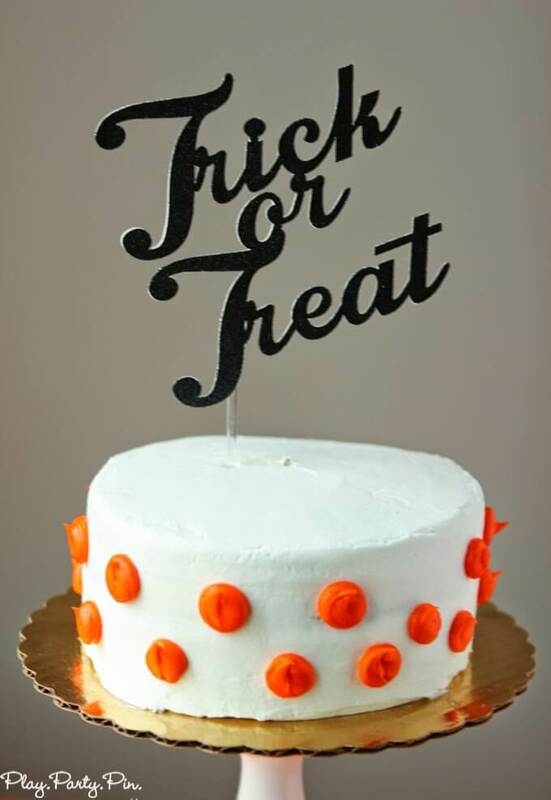 I love the Trick or Treat cake topper! 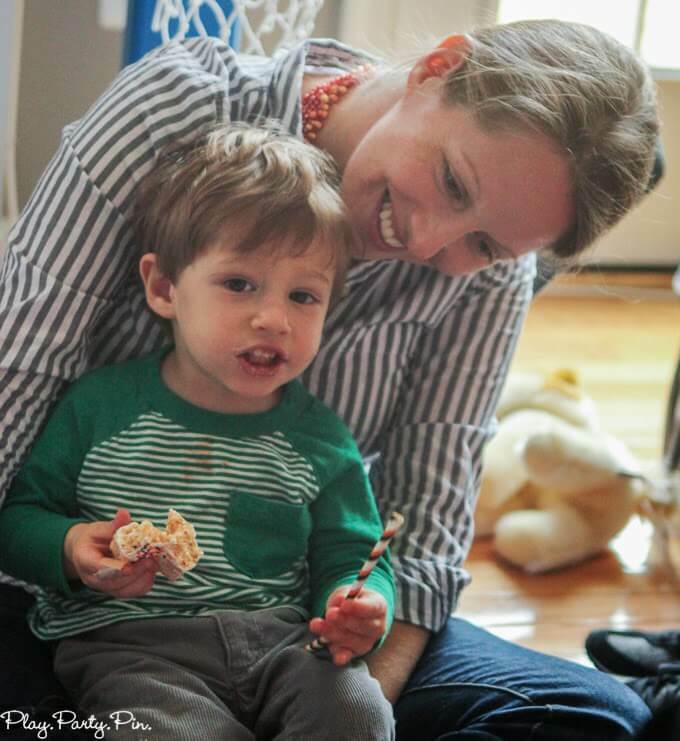 I had a party for toddlers too, and that certainly got messy fast! I like the favor table. 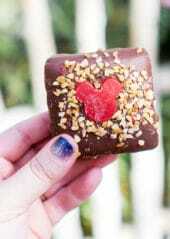 It’s a great reminder to guests to grab and go on their way out! The cake topper was so easy to find. 🙂 Yeah, toddler parties are definitely messy, but they’re so much! What a cute party! 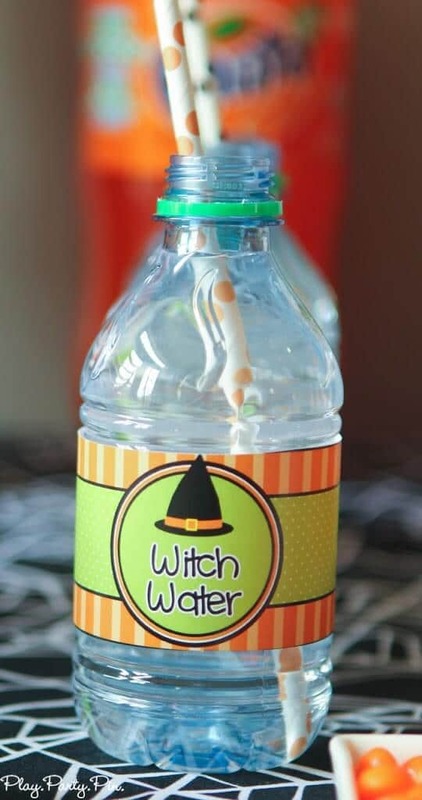 I love the “witch water” labels! Awesome! I love the polka dot cake! WOW! 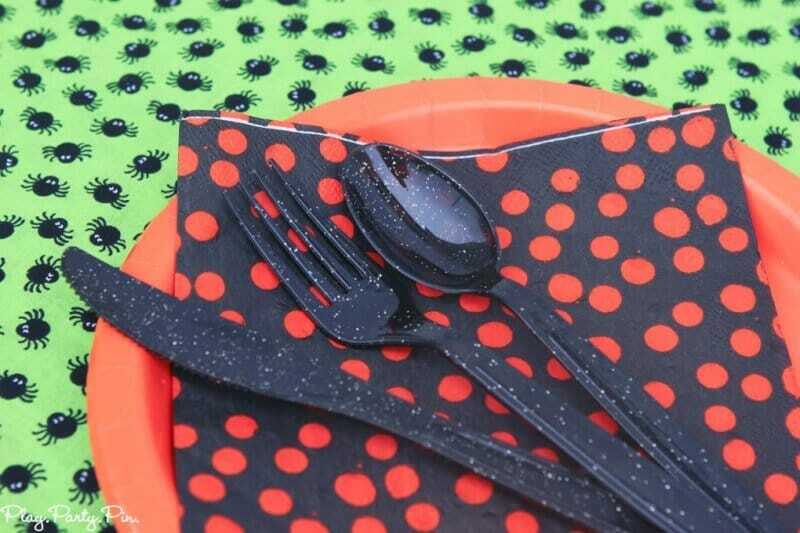 These are some fantastic ideas for a toddler party. 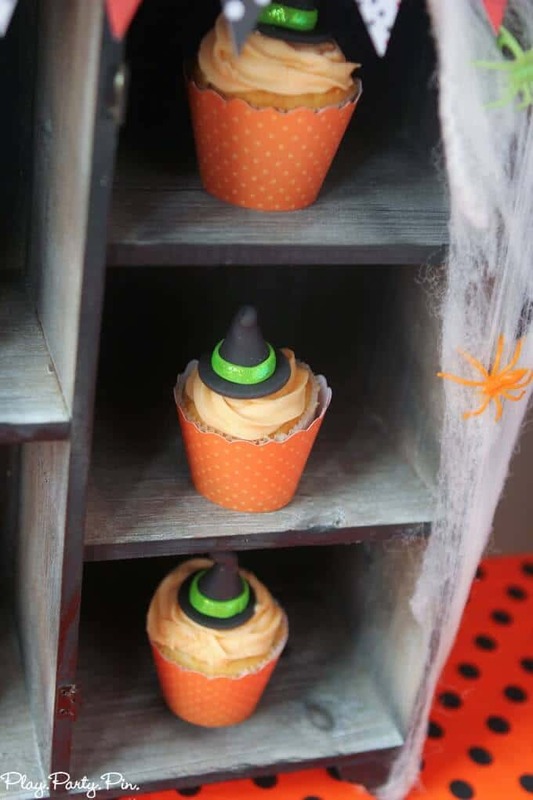 I will definitely be using some of these ideas at our party this weekend. Thanks! What a fun party–I’ll bet they loved it! Very cute! I am considering what to do for this Halloween. 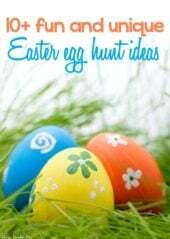 These are some great ideas to get started! Pinning! A million great ideas! 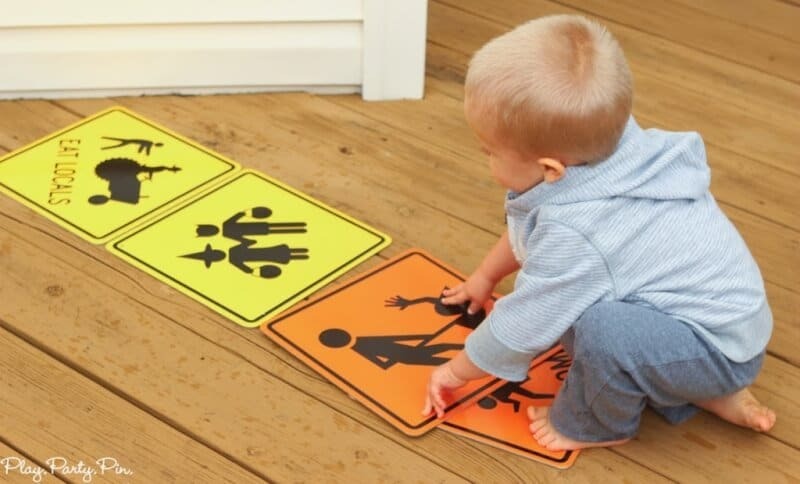 I love that they are perfect for little ones. Very cool! Now I wanna throw a Halloween party!